Ground breaking non-contact technology from ABLE Instruments & Controls achieves real time measurement of drilling fluids in partially full pipe conditions. It has long been recognised that flow and density measurement of drilling fluid (mud) results in improved drilling control and increased safety whilst lowering non-productive time (NPT) of the drill rig, reducing overall costs without compromising safe operation. The challenges to achieve this goal are extreme due to the variation in conditions of the drilling fluid during operation, including partially full pipe conditions and wide variations in the fluid make up. Following extensive trials with a major drilling operator, the ABLE MudMaster has succeeded in achieving accurate and repeatable measurement of both oil based mud (OBM) and water based mud (WBM) in real time, providing invaluable information for drilling optimisation and identifying leading indicators to potential operating problems. During drilling operation, drilling fluid is pumped into the drill string to stabilise the well bore, remove cuttings and cool the drill bit. Maintaining proper density of the fluid is imperative to ensure downhole pressure is correctly managed, whilst accurate measurement of flow rate entering and exiting the well provides assessment of drilling performance and indication of a potential well control event. Drilling fluid sweeps are commonly run using high density material to augment hole cleaning and prevent accumulation of cuttings which if left unattended can lead to hole pack-offs, stuck pipe and other unwanted incidents of NPT. Variations between the balance of inlet and outlet mud flow and density can indicate lost circulation – the effect of the drill encountering fractures or caverns in the formation resulting in lost fluids – or detect a kick – pockets of formation fluids flowing into the well. Without early indication enabling appropriate action to be taken these well control incidents can lead to significant increase in NPT or even a catastrophic event such as a blow out. 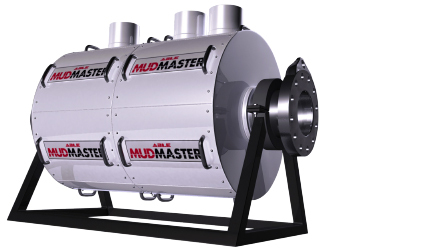 Accurate flow and density measurement utilising the ABLE MudMaster produces information used to determine the effectiveness of sweeps, detect kicks and identify lost circulation resulting in optimised drilling performance, increased safety, reduced NPT and associated costs. Ultimately, automation of the mass flow balance is achievable. Traditionally, density and flow rate have not been measured in real time. Inlet flow is often derived from the mud pump stroke count with outlet flow measured using a mechanical vane type flow transmitter and the density being determined offline at intervals via a sample point, resulting in inaccurate and time lapsed information. More recently, coriolis mass flow meters have been utilised to successfully measure inlet flow under the more controlled process conditions encountered at this point, but with far poorer performance when exposed to the complex conditions exhibited on outlet flow. The ABLE MudMaster independently measures flow and density using a development of established measurement techniques, diagnostically aggregated to produce reliable, accurate and repeatable real time data. The instrument is spool mounted to bolt directly into the outlet pipe and the non-contact nature of the technologies employed provides no restriction to mud flow, zero pressure drop and no moving or process contact parts subject to wear or requiring maintenance. Extensive trials have been completed, proving performance under actual drilling conditions including variations in partially filled pipe conditions, as well as the wide range of fluid constituents, flow rates and densities experienced during drilling operations. ABLE Instruments & Controls offer solutions for flow, level, temperature, pressure, density, media analysis, moisture, humidity, process control and radiometry. With its detailed knowledge of the instrumentation and process control markets, ABLE offers value-added engineering services and package procurement contract assistance, as well as instrument calibration and repair. For more information about ABLE’s instrumentation and control solutions, visit the company web site at able.co.uk.